The county has partnered with cat cafes and pet stores, getting adoptable pets out in front of more people. Raining cats and dogs? Not at King County’s animal shelters, where unique partnerships have boosted adoption rates of pets by more than 20 percent in just one year. 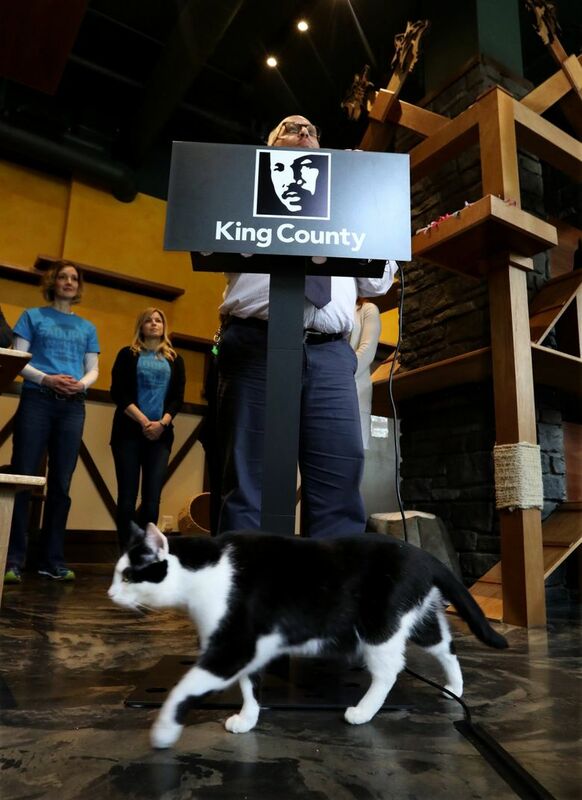 The success in finding new homes for abandoned, relinquished and homeless animals was announced Thursday by King County Executive Dow Constantine at Seattle Meowtropolitan cat cafe in Wallingford, where more than 130 cats have found “forever homes” since the cooperative effort began in 2016. 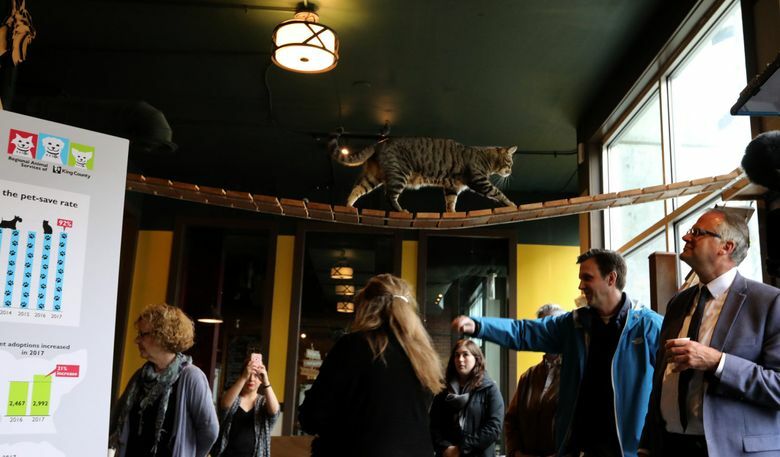 “When you put cats in an area where they can just show off their best colors … and be themselves, you really increase their chances of being adopted,” said cafe manager Reid O’Donnell, explaining how cats housed at the coffee shop have the freedom to be around people — or in a back room if they are not feeling social. “There’s lots of people who come in feeling unsure, but then a cat jumps in their lap and they’re like, ‘Oh, I better go get some cat supplies ’cause I guess I’m getting a cat,’ ” she said. 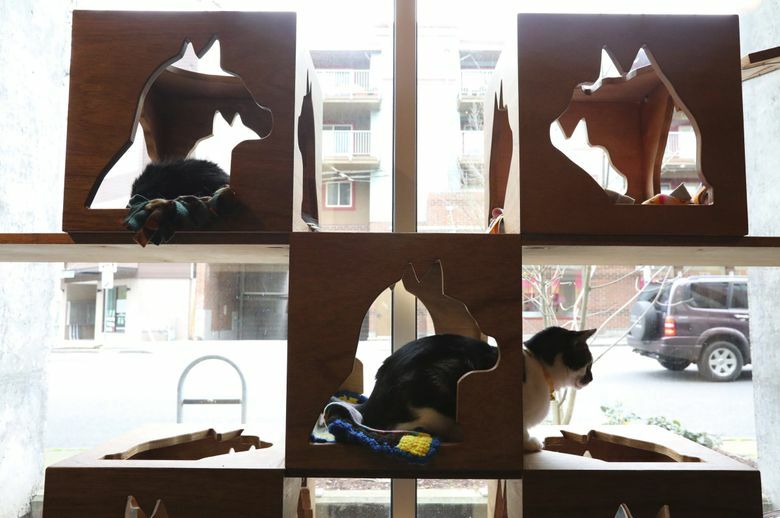 The partnership with Meowtropolitan, Neko Cat Cafe, Cafe Cocoa and a number of pet-supply stores was among ideas championed by shelter employees and volunteers, said Gene Mueller, the manager of the Regional Animal Services of King County. King County connected 2,992 animals to new families in 2017, up from 2,467 the previous year, a 21 percent rise. 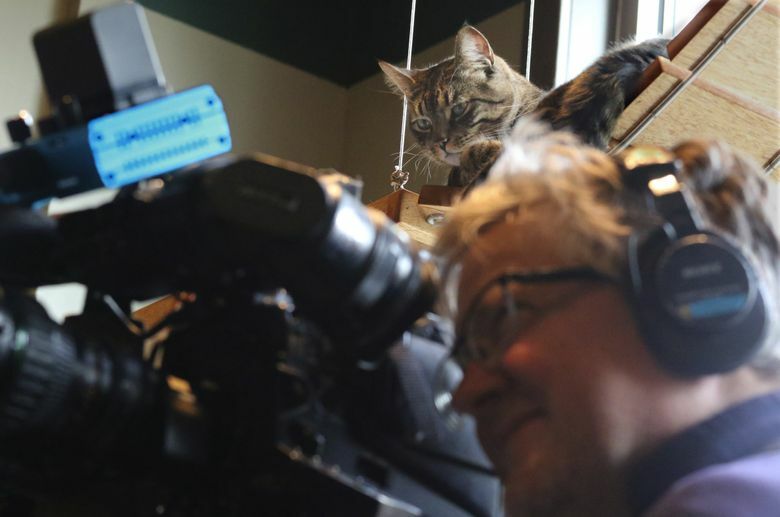 Giving them free rein to be creative about getting animals into homes with people who want them — and having a troop of more than 750 volunteers who last year donated more than 120,000 hours of time — were among the key factors in raising adoption rates, Mueller said. A $75,000 grant from Petco Foundation also allowed the regional shelter to replace steel cat cages with cat condos, plus create colony rooms where people can interact more freely with animals, and bring in professional trainers to create behavioral modification programs for dogs. Mueller also said the agency has streamlined the adoption process to one online application and lowered the fees to $30. 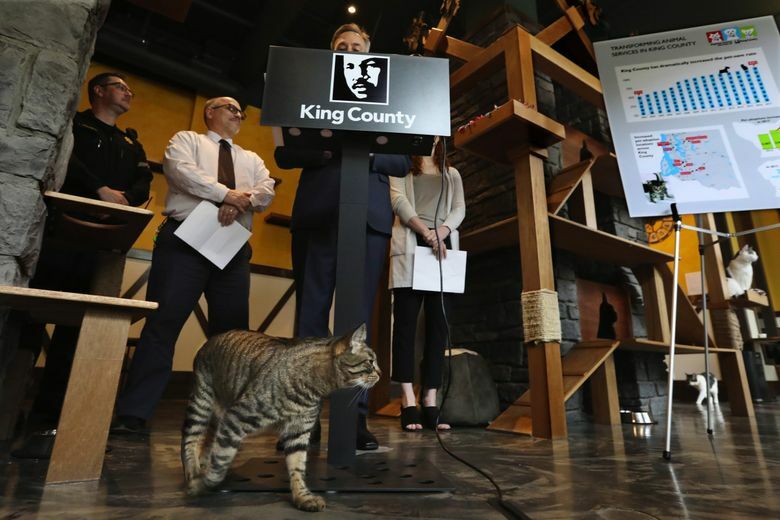 The county’s success in raising adoption rates comes more than a decade after Constantine and the Metropolitan King County Council issued a directive to lower shelter kill rates, which at the time were just over 50 percent of the county’s shelter animals. Since then, the percentage of animals euthanized at county shelters has steadily decreased and now hovers around 8 percent, Constantine said. The county is not alone in seeing an increase in adoption rates and a correlating decrease in kill rates, said Seattle Animal Shelter executive director Ann Graves in a recent interview. 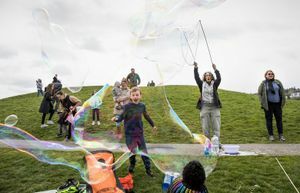 The annual euthanasia rate has also declined at the Seattle shelter, and nationwide, has gone down continuously over the past two decades, she said. Graves said that’s due in large part to the successful campaigns encouraging people to adopt shelter animals and to have their pets neutered or spayed. In 1970, according to the American Society for the Prevention of Cruelty to Animals, roughly 20 million stray and homeless animals were killed in shelters nationwide. By 2011, that number had dropped to 3 million. Last year, an estimated 1.5 million shelter animals were euthanized. 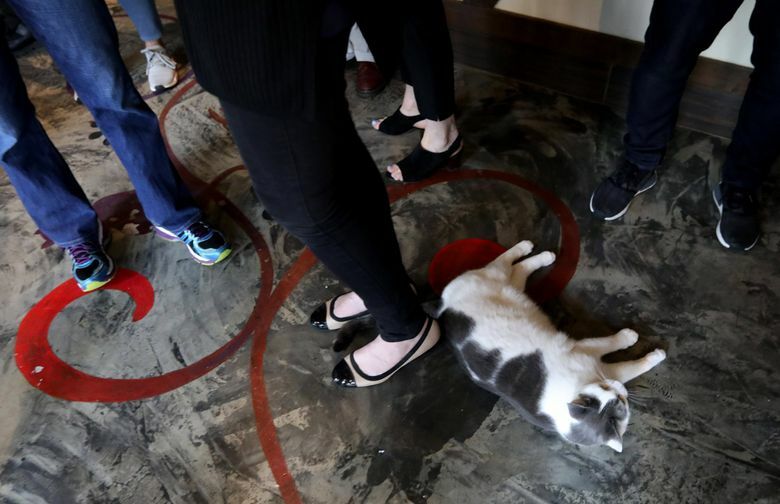 The society said the decline can be partially explained by an increase in the percentage of animals adopted and an increase in the number of stray animals successfully returned to their owners.